Deal five cards face-down to each player. Players may look at their own hand. If you get a Baby Card (any card with the word "Baby" on it) in your initial hand, put it face-down on the playmat on the matching color block. Draw a new card to replace it so you still have five cards; repeat as necessary. Roughly separate the remaining deck into three Draw Piles and put them face-down on the playmat. Pick a player to go first. (Some sample criteria: furriest, most recent tantrum, most body parts, etc). You can play up to two cards on your turn to build Monsters. You must play a Head Card to start building any Monster. Add strength by adding additional body parts. Your collection of Monsters is your MONSTER ARMY. 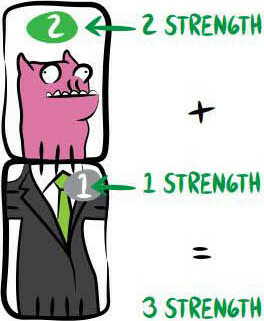 Build as many Monsters as you can, and add as many body parts to them as possible to add to their strength. As you build, make sure the stitches line up. Important: You don't have to complete a Monster to start building another one. If you can't play two cards, you can draw a card instead. 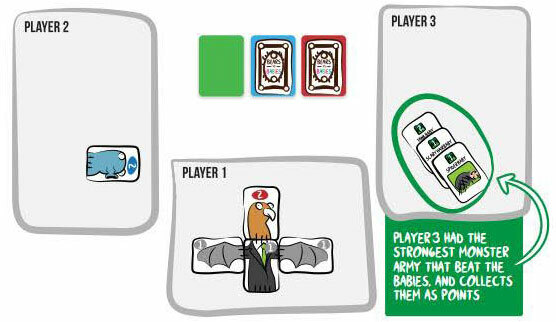 There are three Draw Piles to help randomize the cards you draw. Drawing a card or playing a card is an "action". Draw or play a card. Tip: Count your actions out loud so that everyone can keep track. There is no maximum or minimum number of cards you can have in your hand. When any Draw Pile is depleted, do not replace it. Just work with the remaining Draw Piles. If you draw a Baby Card, put it face-down in the matching Baby Army. Important: Drawing a Baby and putting it on the playmat counts as one action. The goal of building Monsters is to make them strong enough to eat the Babies. All your Monsters of the same type fight together, so you really have three Armies in front of you. Notice that you can build multiple Monsters of the same type and add their strengths together because all your Monsters of the same type will always fight together! 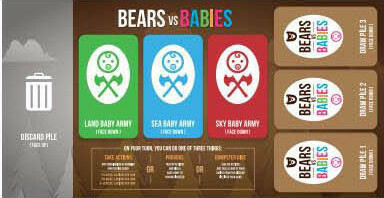 Notice there are three types of Baby Armies to match the three types of Monster Armies. The goal of the game is to build Monsters strong enough to eat the Babies when they attack. Babies will attack whenever they are provoked. Pick one of the Baby Armies to provoke. Turn over the Baby Army that's been provoked and add up the strength of the Baby Cards in the pile. A provoked Baby Army will attack ALL players' Monster Armies of the matching type anywhere on the table. All matching Armies anywhere on the table must fight! Including those of the player that provoked the Babies! 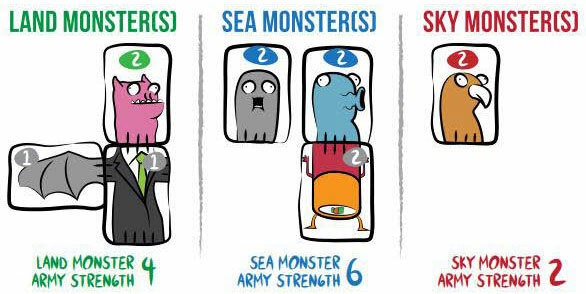 The player with the strongest Monster Army that can beat the Babies wins the battle and collects the Babies as points. If none of the players can beat the Baby Army, the Babies win and are moved to the Discard Pile. If there's a tie between the Monsters and the Babies, the Monsters win. All Monsters and Babies only fight once! After a battle, all Monsters that fought are discarded regardless of who won. As you can see, provoking the Babies can clear huge Armies from the table, so use it strategically! You can provoke a Baby Army when you think your Monster Army is strong enough to eat the Babies, or provoke to wipe out another player's Army before it grows too powerful. Tip: You can provoke a Baby Army if you don't have any Monsters of that type. It's a great way to hurt your opponents! There are five Bear Heads in this packet (cards with the word BEAR at the top). Keep them separate for a moment. These cards are the strongest but also the most vulnerable cards in the game. 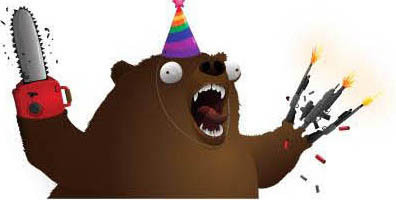 Bear Heads are all three types of Monster (LAND, Sea, and Sky) which means they must fight in EVERY battle. Use them carefully. Shuffle the cards from both packets together REALLY WELL. Deal one Bear Head to each player. (SHUFFLE any extra Bear Heads into the deck). Deal four more cards to each player so that your starting hand is the Bear Head plus four more random cards. Once again, put any Baby Cards dealt in your initial hand on the playmat face-down and replace them until you have five cards. Roughly separate the deck into three face-down Draw Piles on the playmat. Any combination of Drawing and Playing cards. 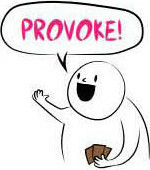 Take no actions and pick a Baby Army to Provoke instead. Take no actions and take a card of your choice from the Discard Pile into your hand. Remember: If you draw a Baby Card, you must move it to the playmat. Drawing and moving a Baby counts as 1 action. This isn't practice, so you don't have to spend three rounds just building Monsters. Tip: Be strategic about when you play and when you draw. You might want to build powerful Monster Armies immediately, or collect cards for a while and let your opponents fight it out. Remember, you're trying to eat as many Babies as you can to win the game! When all the cards have been drawn, the player with the most points wins! Points are determined by adding up all the numbers on the Baby Cards you've eaten. 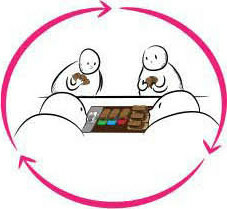 When a player draws the last card from the last Draw Pile, that player will complete their turn, and then every player (including the player that just drew the last card) will get one final turn. You don't have to take all your actions on your final turn if you don't want to. Add this rule to the game because you really like rules and want more of them. 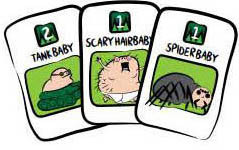 After each player takes their final turn, there will be a final attack in which Baby and Monster types are ignored. 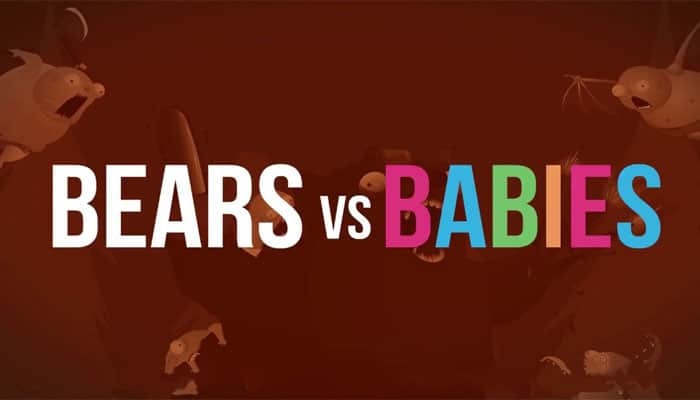 All the Baby Armies left on the table will combine forces to attack all players. The player with the strongest combined Monster Army who can beat the combined Baby Army will win the battle and collect the final points. (Otherwise, the Babies win and no one collects the final points). All other normal battle rules apply. The cards come separated into 2 packets when you first open the box. If they're not separated into packets anymore and you really want them to be, the easiest way to recreate the packets is to gather all the Heads, body parts, and Babies into "Packet 1" (87 cards) and everything else into "Packet 2" (20 cards). It's not exactly the way the game was packaged, but it's close enough to get you going.